The current outside temperature is displayed in 1°F (1°C) increments. The temperature range is between -40°F~176°F (-40°C~80°C). The outside temperature on the display may not change immediately like a general thermometer to prevent the driver from being inattentive. If the battery has been discharged or disconnected, the temperature mode display will reset to Fahrenheit. This is a normal condition. You can switch the temperature mode between Fahrenheit to Centigrade as follows; Press the “H” and “M” buttons at the same time for more than 1 seconds but less than 3 seconds. 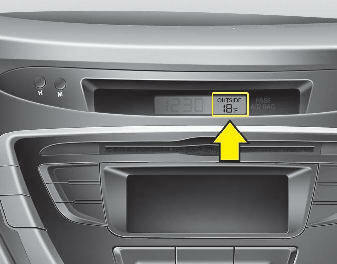 The display will change from Fahrenheit to Centigrade, or from Centigrade to Fahrenheit.